Papers revolutionizes how you discover, organize, read, share and cite. The first thing you’ll notice when starting Papers 3 is the new stunning user interface. 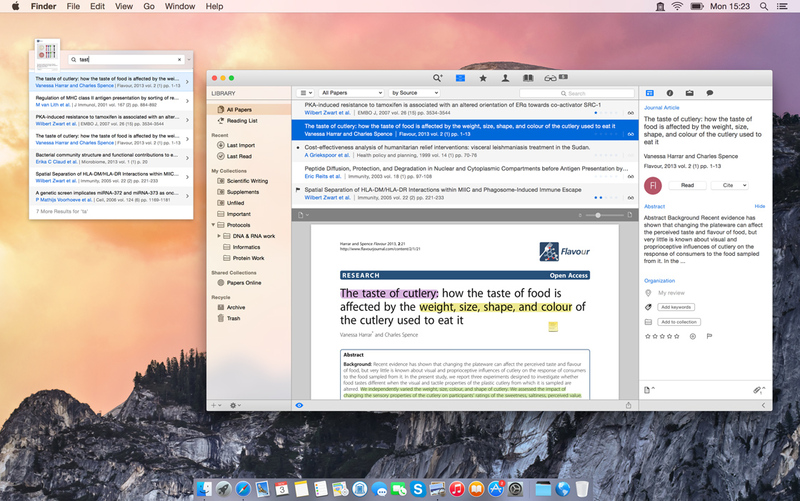 One of the most important changes in Papers 3 is however almost invisible: how easy it is to sync your library between your computers (Macs or PCs) and your iPad and iPhone. We’ve taken a hard look at the whole application and built cloud based syncing as a core feature to all of Papers for Mac, Windows and iOS. Papers now uses Dropbox instead of a local wireless network for syncing, making it easier to get access to your library both at home and in institutional networks (other cloud based syncing services, as well as local wireless network syncing in addition to Dropbox to follow). With Papers 3, we have also introduced Papers Online. Papers Online offers a convenient reading list and shared collections. You can create a collection to share with your team and collaborators. You can access the reading list and shared collections also from a web browser when you don't have access to Papers for Mac. A fresh, new user interface: the new Papers experience is simpler and more organised. Navigation modes to keep your work and thoughts organized. Relevant article suggestions based on the content you are reading. Automatic PDF download when you import articles. Better than ever meta-data discovery and matching (including batch matching). Stay connected: discover tweets and posts about the articles you are reading. Download, view and annotate supplemental files directly within Papers 3. Import formatted references via "File > New Paper > New from Reference". Auto-suggested matches when adding/editing papers. New Reader mode with annotation support, including free hand annotations. Spotlight search support - search your Papers library using Spotlight in Finder. Cloud syncing with Dropbox in addition to cleaner Wi-Fi syncing. Shared collections and a reading list with Papers Online. Papers Online can also be deployed on demand, privately, to your researchers only - either hosted or internal. Contact us for more information. Script Papers with AppleScript support.